ACRS is privileged to have as our Patron the current Governor-General of Australia, His Excellency General the Honourable Sir Peter Cosgrove AK MC (Retd). Sir Peter was pleased to accept the role as ACRS Patron as he sees the work of the College as complementary to his responsibilities as Governor-General and to themes of personal interest to him. Sir Peter gave a widely acclaimed Boyer Lecture in 2009 entitled A Very Australian Conversation. 40 years of military experience and service to the nation placed him in a unique position to talk about the challenges and opportunities faced by society today and into the future. His presentation covered issues including our regional relationships and our leadership abilities both as a nation and as individuals, the political and sociological changes over his lifetime, and a future we might aspire to—one which will challenge our descendants. Sir Peter said “Paying it forward’. In many ways that is a succinct expression of the major obligation of our existence. Doing things now for the protection and upliftment of relatively helpless future generations, which either don’t exist yet or are presently too young to take action themselves….“. The College was delighted to have Sir Peter attend the 2014 ACRS Award ceremony and help to recognise and reward those working so hard to reduce road trauma. The Video and Transcript of Sir Peter’s address can be found via these links. “(after personally witnessing a road crash with multiple casualties)… looking in the cars to see who was what, just to see all those injuries was a horrible thing. And this for a soldier who is used to, through my calling, to seeing horrible sights. You know we sent a whole lot of doctors and nurses up to the tsunami that hit Papa New Guinea in 1998… it was like a giant casualty ward with traffic accidents. They referred to the action of the water, the high velocity and the power of it – picking people up and ramming them into things. It sounded a lot like a traffic accident. The same remark was repeated to me after the Asian tsunami when we again sent people up to Indonesia, and the scale of that was even greater. And of course, when we go off to war we see all those poor soldiers who have been blown up, shot, and they come in for urgent life-saving treatment. The surgeons we send from Australia are those who have to deal routinely with road accidents, because that’s the greatest similarity. With her term drawing to a close, the Governor-General, Ms Quentin Bryce AC CVO, held a farewell event for organisations to which she lends her support at Government House in Canberra on the afternoon of Monday 24 February 2014. Invited to attend this event were ACRS President Mr Lauchlan McIntosh AM, ACRS ACT & Region Chapter Chair Mr Eric Chalmers (CEO, Kidsafe ACT), ACRS ACT & Region Chapter Chair Mr Keith Wheatley, and ACRS Executive Officer Mrs Claire Howe. Generous support provided by the Governor-General to help the College in our drive to expedite reductions in road trauma, including the provision of an opening address (via Video) for our Australasian Conference in Sydney in 2012. We’d like to again thank the Governor-General for her warmth, enthusiasm, and generosity as our Patron over the last 6 years, and wish her all the best for her future endeavours – which, as she pointed out at her farewell event, will include spending a lot more time with her excited grandchildren! 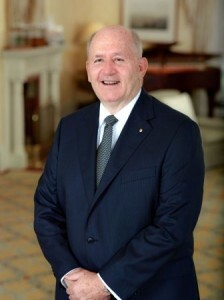 The Governor-General in-waiting, former Defence chief Peter Cosgrove, commenced his term on 28 March 2014. 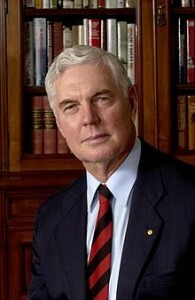 The College is proud to have been provided the strong support of Patron Major General Philip Michael Jeffery AC CVO MC during his term as Governor-General of Australia from 2003-2008. Major Jeffery is a retired senior Australian Army officer who was the 24th Governor-General of Australia. During his term as College Patron and as Governor-General of Australia, Major Jeffery presented our current President, Lauchlan McIntosh AM, with the prestigious ACRS Fellowship.